This is your life. Make it large. I rarely watch TV but being an cricket fan, last Sunday I was watching India vs. Australia wt20. During commercial break, I saw this new ad featuring SRK in which he talks about the joy of getting things for the first time or doing something for the first time. In the end he spoke one line and that caught my attention. 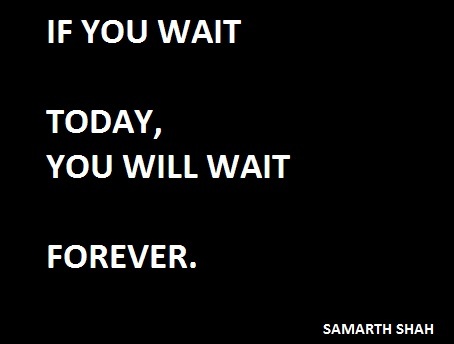 We humans can do most of the things we want to do but the real challenge is to be persistent. Success is not a one time thing. It is a continuous process. This theory is very well visualized in movie Rush. It is a story of two F3 drivers and their journey towards becoming F1 world champions. One got satisfied and stopped practicing after winning first title and other kept on practicing and he won several titles. The one who stopped practicing died at the age of 45 and other got worldwide recognition. Posted in Food For Life and tagged attention, challenge, champions, cricket, F1, F3, fan, humans, jobs, Journey, large, Learn, Life, make, process, recognition, rush, SRK, steve, TV, visualized, worldwide, wt20. Bookmark the permalink. It is not an Experience if you can not learn from it. We all have heard that “Experience makes man perfect”. 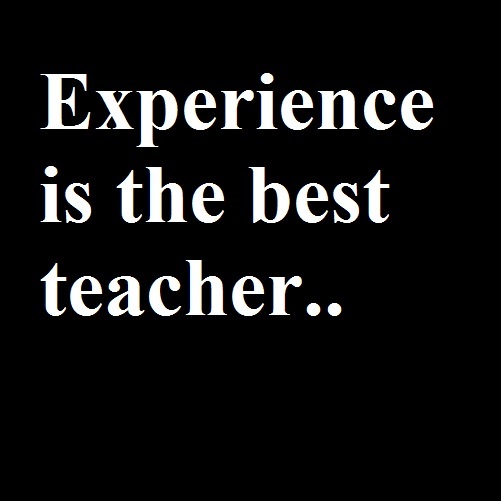 “Experience is the best teacher”. But do we know the inside story. Recently I realized that all the proverb/thoughts are right but not always. 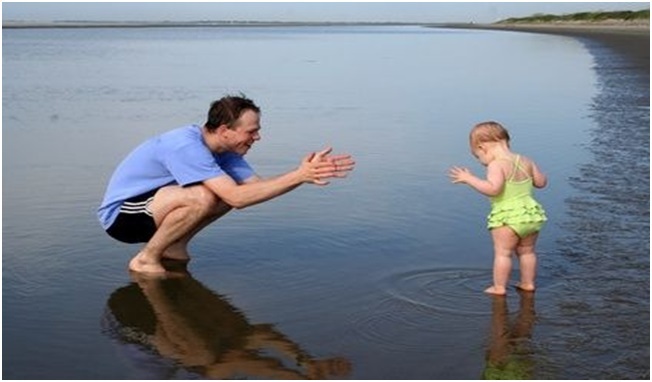 It is true that experience is the best teacher but only if you are ready to learn. For example you are working on some project/ somewhere and if you can not learn from your mistake then it is not worth. In this case you had experience of working on project/somewhere but you have not learnt anything. 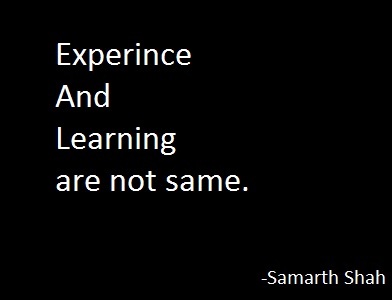 So my point is experience and learning is not same. 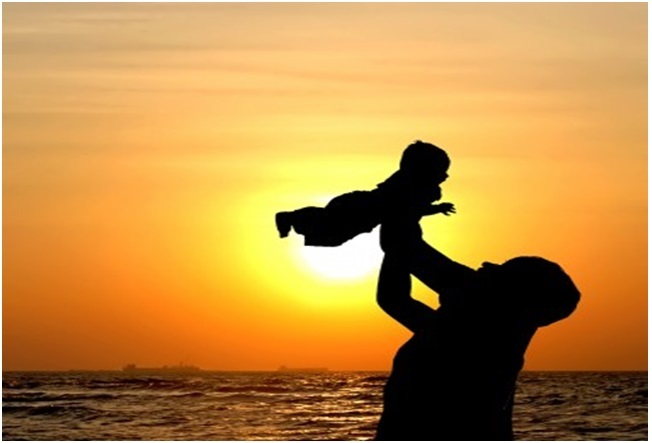 If you have great experience on something then you can not be sure of learning aspect. But instead if you learnt something then it is for sure that you have great experience. And for learning it does not matter for how much duration you have worked. The only thing that count is “What you have learnt”. Always look for learning factor in whatever you do. Experience will automatically come. Posted in Food For Life and tagged automatically, best, Different, do, Experience, leanrt, Learn, Learning, Life, makes, same, SRK, teacher, whatever. Bookmark the permalink. If you are feeling like “Is this really my life?” than this post is for you. Don’t worry you are not the only person who feels the same. There are thousands of people out there in the world. Do you feel like why I have so many problems in my life? .Always remember one thing “If you don’t have problems in your life than I am sure you are not living life.” Life is what you make of it. There are moments when you ask God “Why me?” But according to me you should be thankful to him because he tried you. There are thousands of people like you in the world but he chose you. There is something unique in you. So now on wards when you face problems and you feel like “Why me?” Just remember above lines and say “Try me.” . If you are not convinced yet than let me explain it it a different way. 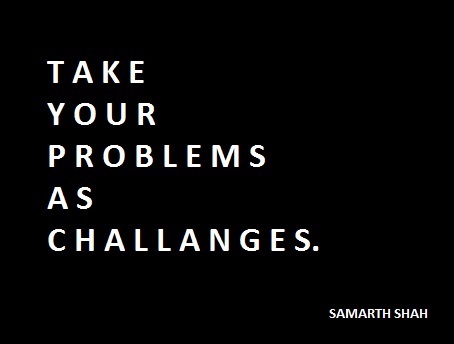 If you don’t face any problems/challenges and you don’t respond well to those challenges than you will die like an ordinary person. No one will remember you. Is it okay with you? or on the other end you want yourself to be remembered by next generation. Still not convinced: Think of the time when you got success . It can be your school/university grade ,extra curricular activities , promotion or it can be anything else. Now ask yourself. When you got success, have you asked “Why me?”. Answer would be “No” Right !!! Than why are you afraid now? Related post: Turn Your Fear into Curiosity. Posted in Food For Life and tagged afrais, beautiful, believe, Control, curiosity, desire, diferent, Difficult, Experience, Failure, Faith, fear, Fear of failure, Friends, God, Good, Learn, Life, People, percent, problems, respond, right, situations, SRK, Stephen Hawking, Success, Thought, Time, try, turn, turns, want, World. Bookmark the permalink. 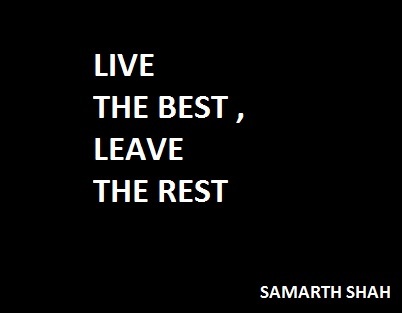 Live the Best and Leave the Rest. Can you imagine world without wireless communication? No. Right. Posted in Food For Life and tagged beautiful, behave, believe, differ, Different, do, eat, Good, happy, Learn, leave, Life, live, Love, marconi, Marconis, Moment, neighbour, People, sad, something, SRK, Stephen Hawking, wear, wirelss, yourself. Bookmark the permalink. This post is for every single person on this earth. If you have not experienced it before, you will surely experience it in your life. You have experienced with your friends , colleagues , classmate , cousins , neighbor and many more. There are situations when someone make you think “How one can behave such way? That is not fair.” But my dear friend as the title says you can not expect everyone to be like yourself. Almighty GOD has made everyone unique. Everyone has their own belief , their own culture , their own value as well as their own thinking process. Probably what you feel for others , the same feeling someone had for you at different situations. The other situation can be “Good things always happens to others.” Then I would say “You are also “others” for someone else.” So respect each and every person you meet. Posted in Food For Life and tagged Bad, Belief, college, culture, earth, everyone, expect, Experience, fair, feel, Friend, Friends, Good, happens, laugh, Learn, Life, live, make, neighbor, others, People, personal, situations, SRK, Stephen Hawking, thinking, Thought. Bookmark the permalink. I agree there are children described “badly” in many articles but there are children exactly doing opposite to it as described in the article above. How one can forget the priceless moments shown below. Whatever may be the condition, human emotions are not going to change. So I am becoming more modern or I must say “Adjusting with the current environment” but my feeling are not going to change. 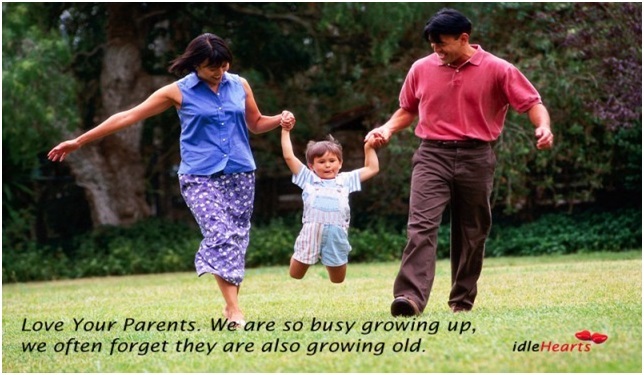 Love you parents. Posted in Food For Life and tagged 21st, Achievement, adjust, adult, alone, baby, Bad, beautiful, born, Century, change, child, current, desire, Difficult, dreams, environment, Feeling, Hate, kid, Leader, Learn, Life, live, Love, parents, People, persona, reach, Situation, SRK, Stephen Hawking, succes, Success, successful, Thought, walk, want, young. Bookmark the permalink. Good People are hard to find on earth…Really????? Posted in Food For Life and tagged Bad, best, change, colleague, early, Friend, Good, hour, Learn, Life, minutes, month, My name is Khan, neighbor, neighbour, no one, People, perfect, SRK, thing. Bookmark the permalink.